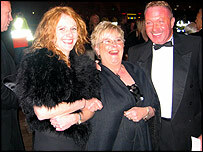 The Queen meets Catherine Tate and other stars after the Royal Variety Performance in Cardiff. The Queen was asked "Is one bovvered?" by Royal Variety Performance star Catherine Tate as Wales staged the annual show for the first time. 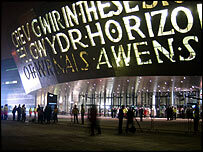 The comedienne won a laugh from Prince Philip as she addressed the Royal Box at Cardiff's Wales Millennium Centre. Dame Shirley Bassey, Charlotte Church, Katherine Jenkins and Bryn Terfel ensured that the show had a definite Welsh feel about it. Sir Cliff Richard, McFly, Ozzy Osbourne and Will Young were also on the bill. The royal couple arrived amid tight security just after 1900 GMT, welcomed by a small crowd who were waiting in the freezing fog. The Queen - wearing a red chiffon gown with a grey woollen shawl - and Prince Philip were greeted by Welsh assembly members along with representatives from the Millennium Centre and ITV, which broadcasts the event next month. They were presented with programmes for the show, placed in specially made boxes of Welsh timber and copper. An honour guard was provided by four Welsh Guards, dressed in full ceremonial uniform. During the show - the 77th Royal Variety Performance - comedienne Catherine Tate, in the guise of her mouthy teenage character Lauren, asked the Queen: "Are you disrespecting me?" When a co-star warned the TV comic "she can have you beheaded", Lauren replied: "I don't even care, 'cos I don't even need it." Looking towards the Queen, she added: "Is one bothered? Is one's face bothered?" The Queen smiled politely, while the Duke of Edinburgh chuckled at the joke. Welsh opera star Katherine Jenkins departed from her usual repertoire to perform a rendition of the Donna Summer hit, I Feel Love, wearing an A-line flashing, multicoloured dress. And the Treorchy Male Voice Choir helped comedian Joe Pasquale sing I Know a Song That'll Get on Your Nerves. Earlier in the evening, three guests arriving for the show - grandmother Maureen Mahoney with her daughter Elaine Dattani and teenage granddaughter Bethan Dattani - said they were especially looking forward to seeing the Welsh stars on the bill perform. Bethan told the BBC News website she was also excited about seeing pop act McFly - whereas Mrs Mahoney said her highlight of the evening would be Dame Shirley Bassey. Mrs Dattani added: "It's absolutely fantastic. It's so wonderful for Cardiff. There's so much going on and it's just a boon for the city and for Wales." Many of those who braved the cold in the hope of catching a glimpse their favourite stars were disappointed - most of the performers arrived much earlier in the day. Matthew Wilson, 18, said he had come to see Charlotte Church, because she was "a good role model". Friend Laura Bibey, 15, said she was frustrated at not being able to see boy-band McFly. Neither had watched the show on television before, but both agreed it was "wonderful" it had come to Wales. The Royal Variety Performance will be shown on ITV1 on Sunday 11 December.